when we moved to nyc from north carolina, i was completely and blissfully ignorant about just how different raising a baby in new york city would be versus raising a baby the suburbs. but in a city that moves at a breakneck pace, being a quick learner is imperative. so, here are a few things that i've learned. nyc is noisy. shocking, i know. so, buy a noise machine. we purchased one when she was a newborn and it was, by far, the best baby item we ever bought. marlo can sleep through anything when it's on and it makes traveling and a routine change much easier. where she goes, the noise machine goes. we even bought one for ourselves. i always keep a large blanket in the basket of marlo's stroller for random park picnics or laying down on the grass for my bum while she runs around. this one is not only cute, but it's cheap. twenty bucks? thank you, ikea. new yorkers don't have costco, they have amazon prime. join it. it's so worth it. free two-day shipping and they have absolutely anything you could think of ever possibly needing. taking a stoller on the subway by yourself can be torture. actual torturous hell. i've been wearing marlo since she was a newborn and, luckily, she still loves it. she's too big for her fabric carrier and has never been into being worn in a sling. 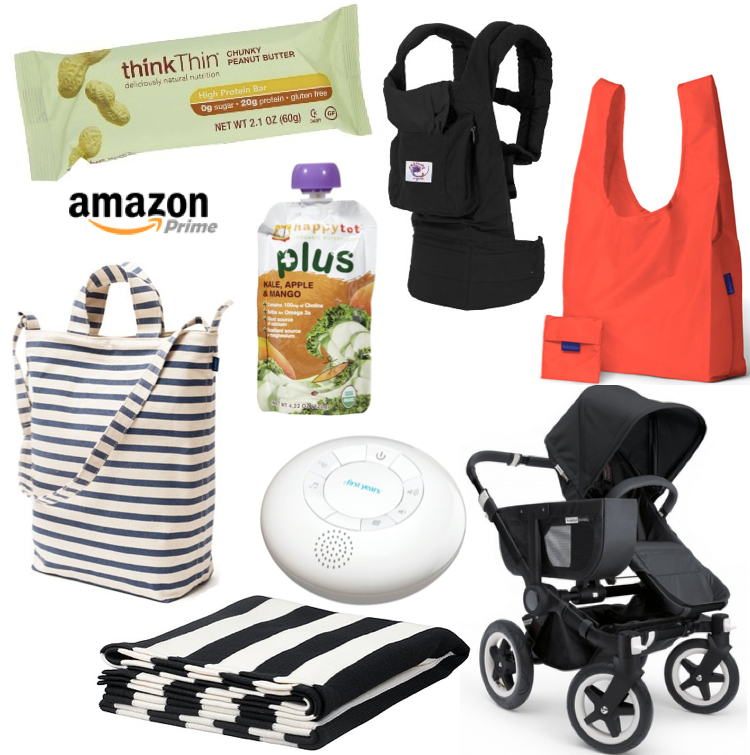 we finally bought the ergo organic carrier and it has proven to be a clutch player in our nyc baby game. she snoozes like a champ in that thing, too. surprise naps? amazing. recently, i've discovered the wonders of baggu. i'm currently using their canvas striped duck bag as a carry-all and love that it can go over the shoulder. and their nylon totes are an amazing way to be a little greener and cut down on plastic bag consumption. i have two or three that i always keep folded in my tote. oh, and these bags are all very inexpensive, which i'm positive any mama can appreciate. always keep snacks on hand. i keep think thin peanut butter bars and happy tot organic fruit snacks on hand for both of us. there is nothing worse than having a baby screaming because she's hungry and still being twenty blocks from home and her lunch. it's the absolute longest walk of your life. and i can't tell you how many times we've been out running errands and i look down at my watch and realize that it's two pm and i haven't eaten since seven thirty in the morning. and since i get really angry when my blood sugar drops, snacks are the difference between life and death for whomever may cross my path. never leave home without wipes. this place is grimy and kids are magnets for dirt. never, EVER, leave home without wipes.